Are you searching to less crowded trekking in Annapurna region? 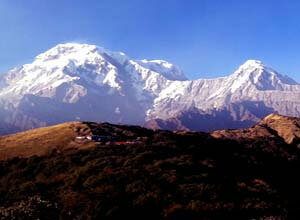 Do you want to see amazing view of Annapurna from high elevation? If so , Mardi Himal trek is best for you. 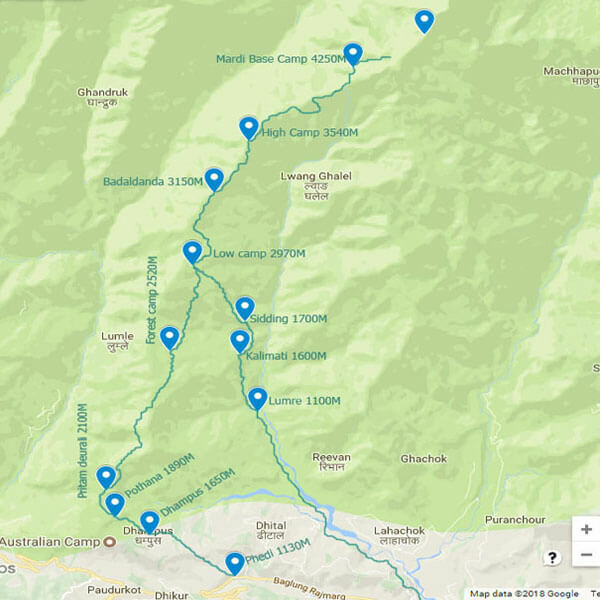 As this is a complete guide to how to do Mardi Himal trek, I recommend using the quicklinks below to navigate to the topic that interest you more. When is best time to do Mardi Trekking ? How long does it take trek to Mardi Himal Base Camp ? Can I Guide Hire ? How much MHT Cost ? How to do Mardi Himal Base Camp Trek ? 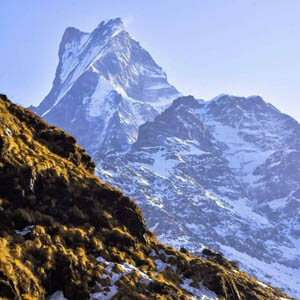 Read the top 5 reason that why you should do Mardi Himal . Mardi Trek lies in Annapurna trekking region from where you can see astonishing mountain view and landscape. Trekkers who like to enjoy at the quiet environment and less touristic area, Exploring mystical Mardi Himal in Annapurna region is the best choice. Mardi Himal hiking offers the panoramic up-close view of mountains like Annapurna South, Hiunchuli, Annapurna Fang, Annapurna I, Mardi Himal and Machhapuchhre. There are simple guesthouses and Homestays along the entire route. The most of the trail at Mardi lies in Forest. We can do either Teahouse or camping trek in for this trek. This trek provides cultural experience, delightful forests along with rocky mountain terrain, and panoramic views of the mountains, astonishing landscape, and a stunning waterfall. Stunning MHT 5 to 8 days is best to explore newly open trekking trail at Annapurna Range. For short trek in Annapurna, Mardi Himal is best. Mardi is not crowded compared to other popular treks in Nepal. The trail is awesome and the view from the base camp is absolutely outstanding. The trail takes you to a very close distance of Mount Machchapuchhre. The Mardi Trek provide everything like a local cultural experience, beautiful forests, hilly terrain, and panoramic views similar to classic Nepali trek does. Mardi Himal offers an eye-catching up-close view of mountains like Annapurna South, Hiunchuli, Annapurna I, Annapurna Fang, Gangapurna, Hiunchuli, and Machhapuchhre. We can get to the top of the ridge in just a couple of days and complete the whole trek in a week’s time. Here are some key facts of Mardi base camp trek(MHT). Best Time/Season March to May and also October to Dec. Except for Annapurna Circuit, most of Annapurna region treks starts and ends in Pokhara. 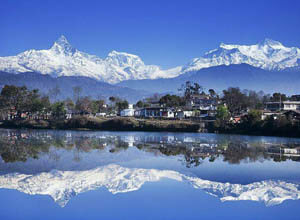 Pokhara is second biggest city and naturally blessed place to relax after the big hikes in Annapurna. It is 200km to west from Kathmandu. The flights take Kathmandu to Pokhara also return route takes 25 minutes flights from the domestic plan and tourist bus takes 7 to 8 hours. Local micro bus leaves every hour from Kathmandu till 3 pm. Middle of September to November:This is Autumn Season which is peak season for trekking in Nepal. December to February: The weather will be good but at that time because of cold its difficult to trek at high altitude. At that, it will also hazardous for trek due to snowfall. 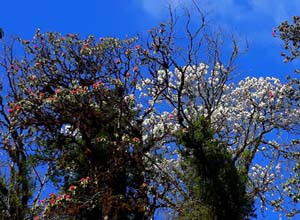 March to May: This is the second best season for trekking in Nepal because of weather and at that time rhododendron will bloom on the forest of trekking area. May - June: This is Nepal's hot pre-monsoon season, and it can get very warm indeed. The valleys are starting to bloom with flowers though green leaves come up, still a good time to trek. June to the middle of September: This is the time of the monsoon. In the monsoon, it will risky for the trek because of the monsoon. The risk of leeches ,landslides and more. It takes 5 to 10 days from Kathmandu to Pokhara and 1 to 2 days transportation days. Our carefully designed 11 days itinerary is for relaxing and comfortable trekkers. Taking Kathmandu to Pokhara and Pokhara to Kathmandu flights and start the trek on the same day is ideas is suitable for the tourist who has holidays about a week. We also provide tailor-made for this trek, so please contact us giving your detail and requirements.I can also offer you this trek itinerary 8 days. Sure, you can do Mardi Himal Trek Guide Hire. We have local expert guide for the MHT. 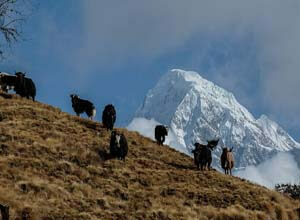 The total cost for trekking to Mardi Himal (MHT) is 280 USD per person for 8 days trekking. It is the price after seasonal discount 25%. This is cheapest price that i mentioned here.It will be more if you want to get more service than i offer here and it will less if you want get less service for cheap package. Airport transposition by private vehicles. Two nights twin sharing on tourist standard Hotel in Kathmandu. One night Tourist standard Hotel in the Pokhara with Bed with Breakfast. Meals on Trekking: Breakfast, Lunch, and Dinner. Kathmandu to Pokhara airfare with airport departure tax. 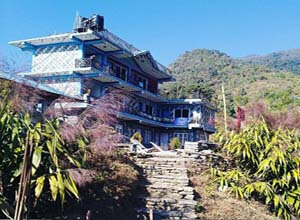 Teahouse basis trekking accommodation on trekking duration. 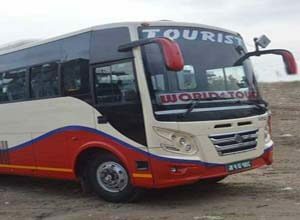 Tourist bus transfer from Pokhara to Kathmandu for guest and guide. Communicative English speaking license holder guide. One porter for two guests who carry maximum twenty kilograms. Annapurna Conservation Area permits and TIMS permits. Pokhara hotel to Phedi and Lumre to Pokhara hotel by Private vehicle. Food, accommodation, salary, insurance, and allowances of Nepali trekking staffs. One map of Mardi Himal. One Nepali simcard(Ncell) for local communication. Lunch and Dinner during staying in Kathmandu and Pokhara. Any kinds of charges like battery charges, laundry, phone calls, any drinks . 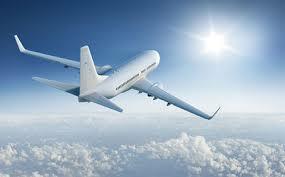 Travel insurance which is incased of emergency (it is mandatory in case of emergency). Donation and temple entrance fees. Tips for the trekking staffs which is not compulsory but highly expected. Any other things which are not specified above. Here is detailed plan that help you how to do this trek . You may arrive at Tribhuvan International airport at given time and will be welcomed by one of our representatives.No need to worry about how to find the vehicle to get the hotel at Thamel because I will be there with a banner. We take a short drive from the airport to our hotel that we had booked. At the hotel, I will show you our day to day itinerary. At that time if you feel that itinerary not suitable for you, I can modify our plan immediately as your choice. The distance from Kathmandu to Pokhara is 200km. By using tourist bus, it takes around 7 hours to get Pokhara. Your guide will come to pick up at the hotel at 6: 25 am. Then will go tourist bus park at Kantipath for catch the tourist bus. The bus leaves at 7:00 am. 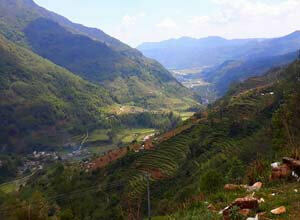 While driving you will see beautiful rice field, landscape, Trisuli River and Also Marsyandi River. If the weather is clear, we will also see the Panoramic view of Ganesh Himal, Manaslu, Lamjung Himal, Machhapuchhre and as well as Annapurna mountain range. The bus will stop for breakfast and lunch at around 09:00 am and 12:00 pm respectively. Overnight stay at the hotel. Day 03: Drive to Phedi and trek to Deurali. After having breakfast at the hotel, a guide will manage private car or jeep according to plan for the drive until Phedi which takes around one hour. From Phedi, our trekking will start. Phedi to Dhampus height the trail is steep up and Dhampus height to Deurali slightly up. We will stay overnight at Deurali from where you can see Annapurna South, Dhaulagiri and also Machhapuchre. From Deurali, our trail passes through the forest of Rhododendrons, Oak, Maple, and Hemlock. There is no place to have lunch on the way the Forest Camp, we will stay overnight there. There are four simple teahouses. From Forest Camp to Low Camp, trekking passing more jungle with a superb view of Annapurna South before getting into Low Camp. After one and half hour walk from forest camp, we will be at Badal Danda. There are four teahouses in Badal Danda, but they are very simple. We can get wifi at the teahouse. From Badal Danda, we leave the tree line and arrive in the shrubby alpine zone. After Badal Danda, the trail breaks out above the tree line and towards the west. From there we can see a good view of Annapurna South and Hiunchuli. Sometimes we can also see the Daphne pheasant (national bird of Nepal) on our way to high camp. The teahouses at high camp are also simple but have wifi. They have a heater at the dining hall. 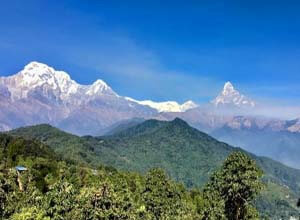 The view from the lodge is superb to Annapurna South, Hiunchuli, and Machhapuchhre (Fishtail). The plan for today is to wake up early morning to see the sunrise view at the mountains after having breakfast. We hike along a narrow way before reaching the Upper Viewpoint. We will see Mardi Himal (5587m), Machapuchhre (6993m), Annapurna south (7219m), Hiunchuli (6441m), Annapurna I (8091m), Baraha Shikhar (Annapurna Fang) (7647m), Tent Peak (5695m), Singhuchuli (6501m) and more others. We trek back to the high camp for an overnight stay. After around three and a half hours we will reach Mardi Himal Base Camp at the height of 4500m. From Mardi Himal Base Camp where one can see Annapurna range and the panorama view of Annapurna South, Hiunchuli, Machhapuchhre(Fishtail) and other mountains of Annapurna. After having breakfast, we will go down Low Camp. At Low Camp, we will take launch. From Low Camp, we will follow the different trail which takes around four hours to reach Siding a traditional Nepalese village. The different trekking route lets us experience something different and makes trek exciting. The lodge at Siding is beautiful which have also attached the bathroom. Overnight in Siding. Siding to Lumre the way is easy because the trekking trail is the road which takes about two hours to reach there. On the way to Lumre, we will see the beautiful waterfall and landscape. 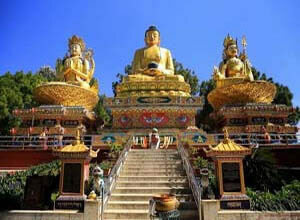 From Lumre we can use a private jeep or local bus according to our choice to reach Pokhara. Overnight stay at Hotel. We ride the tourist bus from Pokhara bus park to Kathmandu and have breakfast and lunch on the way. Upon arriving in Kathmandu, we will go at our Hotel. You can do some souvenirs shopping. In the evening, we will celebrate the successful completion of our MHT as a farewell dinner. Stay overnight at the hotel. Our representative will drop you at the international airport and see you off for final departure to home. I hope that you became inspired to visit Nepal. I hope that you choose us again and recommend to your friends and relatives for trekking and another activity in Nepal. In my opion Mardi Himal Trek is best for Fishtail view as well as another Annapurna mountain view including beautiful forest. The content of website is written by myself(Jayaram). As we are not a native writer for perfect writing, i think there might be some mistakes of grammar and spelling in web contents. I am trying to make perfect content as much as i can. Hope you don not mind. Thank you very much for visiting my website.